Family Photos via Mom’s Photo Keepsakes (July, 1948). I always remembered this photo and by good fortune on January 2, 2016, it magically appeared in a photo album my sister Dianne McNeill had preserved. It now stands as the lead photo in this story of this accident that nearly killed our father, Dave McNeill and injured several others. 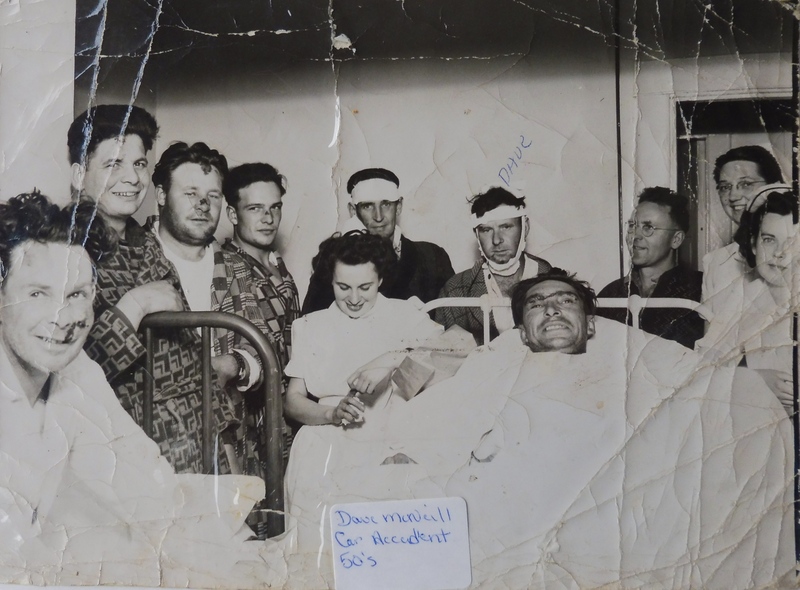 The photo was taken in the Cold Lake Hospital just before Dad was transferred to Edmonton for emergency surgery. 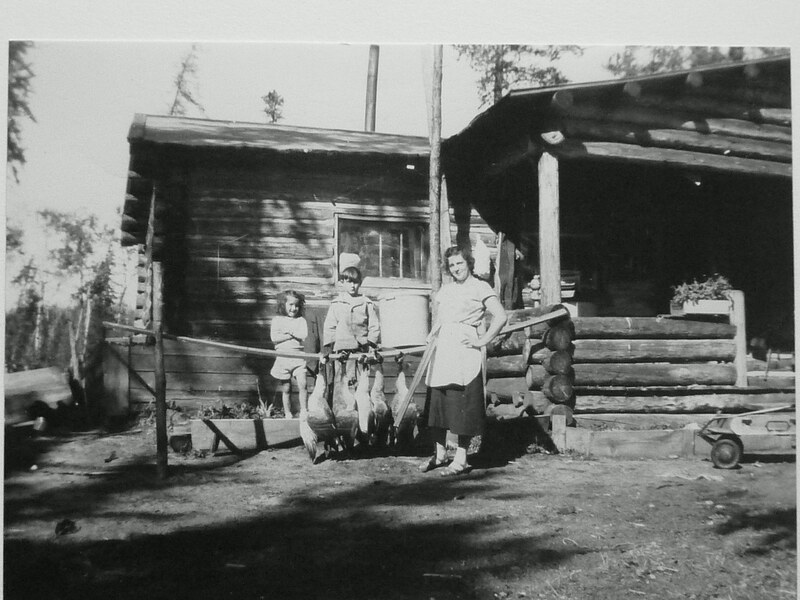 Photo (by Mom): Auntie Marcia, Louise and I stand beside geese shot by Mr. Goodrich our trapper neighbour. Dad love eating fresh cooked goose, but would have a tough time savouring these birds. In mid-July, our family made a regular visit to Cold Lake to buy groceries and other supplies. Heading into town was a big event as it meant visiting family and a chance to play with other kids, not something we had a chance to do very often. There would also be a lively party at someone’s home and while the men didn’t drink much while working in the bush, they made up for lost time when they hit town. It took men many decades for men to learn that when it came to getting home safely after over consuming at a party, horse drawn wagons or sleighs gave a much better bet of arriving in one piece. Cars, in a hands of a drunk driver, were much more deadly. Photo (mom’s files): Harold with guitar, u/k male and female, mom with frying pan, Louise in front of mom, not sure if the man is Uncle Emerson (Dewan) but also looks like Uncle Denny (Helen Pylypow’s dad), and dad with the violin. All standing in from of our home on the West side of Marie Lake. At 10:30 one evening, after drinking for several hours at the Grand Centre Hotel, eight men pilled into old Chevy Coupe and headed to Cold Lake to catch the last call. Uncle Warren, man furthest to the left in the lead photo, was a front seat, right side passenger and as the car hurtled down the long hill leading into Cold Lake hollered: “Lee, for Christ sakes slow down, there’s a turn at the bottom of the hill.” This bit of information came from Uncle Warren some time later as he had not been drinking as much as the others and had been watching the road closely as Lee (Hobbs?) always tended to drive far to fast particularly when drinking. There was so much noise in the car with men singing, hooting and hollering it’s doubtful Lee even heard the warning. With the poor condition of the headlights, he clearly didn’t see the six foot dirt embankment that suddenly looming out of the darkness so the car slammed into it at fifty miles per hour. The men were thrown full force toward as the car came to a screeching, metal bending stop against the embankment. Dad was propelled through the windshield and across the hood. A shard of 1/4 inch glass sliced his neck wide open from the back of his left jawbone down to the right collar bone. He was instantly covered in blood and continued to bleed profusely as he lay unconscious in the dirt. When the car came to a rest, the other men, except for Uncle Warren, were a tangled mass of torn clothes, blood, broken bones, seats and bent metal. Uncle Warren, although not badly hurt, was knocked unconscious. Given the condition of the car, it was later speculated the only thing that saved the men from being killed was a combination of alcohol and being so tightly packed they insulated each other from even greater injury. In Cold Lake it didn’t take long for area resident’s to come running and began prying the men still in the car out of the car and along with the others transporting them to the John Neil Hospital some eight or ten blocks away. They saw dad lying unconscious in the dirt with his throat sliced open and assumed he was dead as he didn’t appear to be breathing. It was a tragic scene as everyone knew all the men in the car. Mom, Louise and I were staying with Uncle Melvin and Aunt Hazel when someone who had recognized Dave came and woke Uncle Melvin to take mom to the hospital. 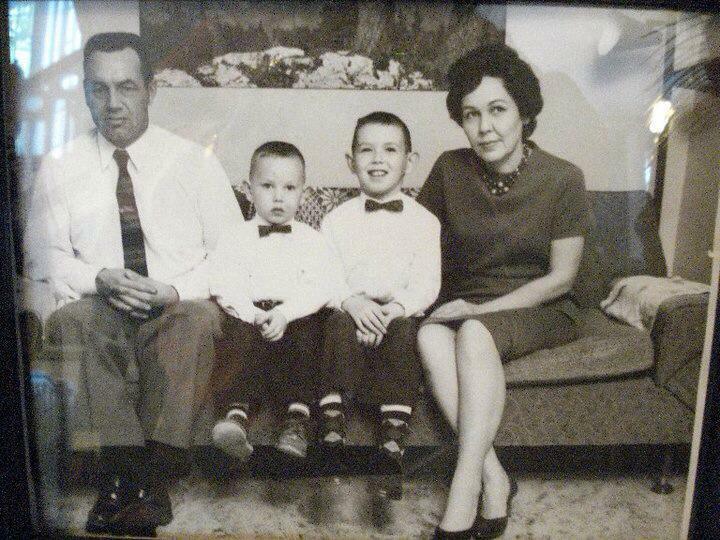 Photo (Mom Files): Uncle Melvin and Auntie Hazel Wheeler with their two son’s Timmy and Randy. We often stayed with them when visiting Cold Lake. “It was nearly one o’clock in the morning when Melvin came in and woke me up. He told me Dave had been in a car accident and we needed to get to the hospital. He had no idea of his condition. It was bedlam at the hospital with eight badly injured men. Doctor Savage and two or three nurses where working frantically. Warren, who by this time was fully conscious, came out and said he saw Dave on a gurney but didn’t know if he was dead or alive. Dr Savage later came out and called me aside. She said Dave was very badly injured and when they first brought him in they believed he wouldn’t make it. As it turned out the gigantic slash his throat had missed his jugular by a fraction of an inch. When they finally got around to treating him, he had regained consciousness but was not able to speak as both the upper and lower jaw bones had been shattered. The doctor was able to suture the large gash in his throat but said he needed to be taken to Edmonton for surgery to repair his jaw bones. Because there were no ambulance services, my brother Melvin drove us. We left later that morning for the five hour trip over very rough roads. Dr. Savage had given me enough sedatives to reduce Dave’s pain on the long trip. Once at the hospital, he was admitted and immediately taken into surgery. Melvin returned home and I stayed with Clifford, my older brother, and his wife Jean, who were living in Edmonton at the time. It took several hours to piece Dave’s jaws back together. His teeth were also wired to keep the bones immobilized while they healed. He certainly was a sorry sight, black and blue, and missing three lower front teeth. After a one week stay we were allowed to return home. We picked up you and Louise and returned to Marie Lake. The situation was not without its humour. It was funny listening to dad as he learned to speak without moving his jaw. With a little more practice, he could have learned to become a very good ventriloquist just like Charlie McCarthy. He used to fool around making Louise’s doll talk while he held it on his knee. Three missing teeth allowed him to sip mashed food through the hole. Dad didn’t think it so funny when we all laughed at his eating noises. Louise and I could feel the wires used to stitch the bones. For the rest of his life, dad had a giant scar across his throat. Although he took most of the ribbing in good humour, he really missed being able to chew his food. Whenever we had a big meal of roast beef, chicken or turkey, he’d patiently mash everything on his plate then sip away. It was hard not to laugh. The most memorable meal he missed was after Mr. Goodrich and Aunt Marcia had shot several geese. Dad loved roast goose but the meal just wasn’t the same when reduced to a soft mush. It was the same thing for fresh corn on the cob. Photo (mom’s files). Louise, Harold and Aunt Marcia (Pick) and severn guess shot by Mr. Goodrich. As repeat visits to the hospital seldom occurred in those days, mom became the nurse. When the day came to remove the wires holding dad’s teeth together, mom began by sterilizing a pair of her scissors and a pair of dad’s pliers. She then clipped the wires that were intricately woven through his teeth. After each was snipped, she would wiggle it loose using the pliers. It took mom about two hours to cut and pull the intricately woven wires. It was a painful process as bends and kinks in the wires scratched dad’s gums causing them to bleed. Even with the wires removed, dad couldn’t move his jaw. He’d been told by the Doctor that it would take a few months to get it mobile and during that time he was to chew gum to exercise the muscles. He learned to hate chewing gum. Although he fully recovered from the injuries, there was one daily job that dogged him for the rest of his life – shaving his neck and lower chin around the scars. During his morning shave he would routinely knick himself and would come out with little pieces of cigarette paper stuck all over his neck. It was a small challenge considering he had been left for dead at the side of the road just a couple of months earlier. While lady luck had smiled upon Uncle Warren during that car accident, he would again soon face down the grim reaper on the thin ice of Marie Lake.